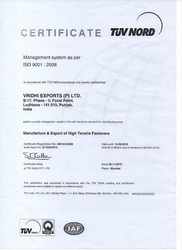 Vridhi Exports Private Limited, started its operations in the year 2014 and is one of the prominent manufacturers and exporters of a qualitative array of Metal Bolts, Metal Washers, Metal Nuts, Metal Pins, Spring Channel Nuts, Brass Components, Threaded Bars and many more. These industrial fasteners are widely used for the purpose of mechanically joining and affixing two or more objects together in various industrial applications. Offered by us in various sizes, shapes and designs, the offered fasteners are known for their rich attributes such as seamless finish, high tensile strength, durable construction, accurate dimension and compact design. Our large production line and spacious storage facility has helped us in taking and meeting the bulk assignments in the most efficient manner. Keeping the ease of our valuable customers in mind, we accept different modes of payment such as cash, online and demand draft. To cater to the diverse requirements of our customers, we have established a huge infrastructural facility that is known for its large scale production. In addition to this, we have made strong associations with some of the most trusted and reliable vendors of the industry, who are associated with us over a long period of time. Mr. Inderjit Singh is our international marketing executive and has helped us in catering a huge clientele across the globe such as Europe country and USA. 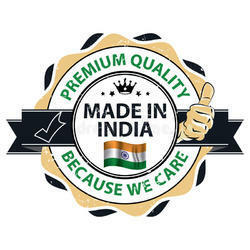 We believe that his experience and knowledge of this domain has helped us in catering to the precise needs of our valuable customers in the most efficient manner. 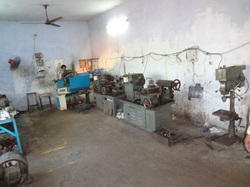 We provide customization facility to our clients on designing as well as manufacturing of our range of components. We have set up an in-house designing unit and have employed an experienced team of designers who first try to understand the requirements of the clients in detail, before starting with the designing work. This helps us in ensuring that the end product is in exact tandem with the specific needs of our clients. 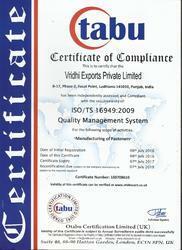 We have a team of experts and experienced personnel that efforts have helped us to mark ourselves in our domain. With the support of their industrial experience and in-depth knowledge of the concerned industry, we are constantly striving towards producing our range of products that are in synchronization with the market trends. We have a state-of-the-art infrastructure unit that is spread over a vast area having separate divisions for different operations of our business. Our infrastructure comprises of manufacturing facility, R&D unit, a testing laboratory and a spacious warehouse. The manufacturing unit is well equipped with all the requisite machines and equipment to meet the bulk and urgent requirements of our clients.